Services for Starling Josephine Jordan will be held at 1:00PM Friday, February 8, 2019 at The Price - McElroy Funeral Home in Mt.Victory with Pastor Jeffrey Willetts officiating. Private family burial will follow at Byhalia Cemetery. Friends may visit 2 hrs prior to the service on Friday, February 8, 2019 at the funeral home. She died on February 1, 2019 in Kenton, She was born on June 12, 1918 in Liberty Township, Union County Ohio to the late Lonnie and Celia McElroy Gray. On March 9, 1941 she married Arthur Irvin Jordan in York Center and he preceded her in death on May 9, 1992. Surviving are four children; Larry (Paulette) Jordan of Ridgeway, Elaine (Lonnie) Harvey of Rushsylvania, Tom Jordan of Kenton and Bill (Nancy) Jordan of North Carolina. 14 Grandchildren; Christine Jeffers, John Jordan, Susan Pavel, Carol Burrey, Rob Harvey, Wendy Levan, Julie Miller, Shawn Jordan, Todd Jordan, Joshua Jordan, Jinell Jordan, Jenna Coffman, Sarah Holcomb and Travis Huber. 31 Great Granchildren and 6 Great Great Granchildren. She is also survived by a brother in law; Mark Lay of Mt. Victory, Sister in law; Mary Jordan Mccurdy of Marion and many nieces and nephews. She was preceded in death by a sister Janet Evelyn Lay, 2 infant brothers; Dana and Lowell Gray and 2 infant great grandchildren. 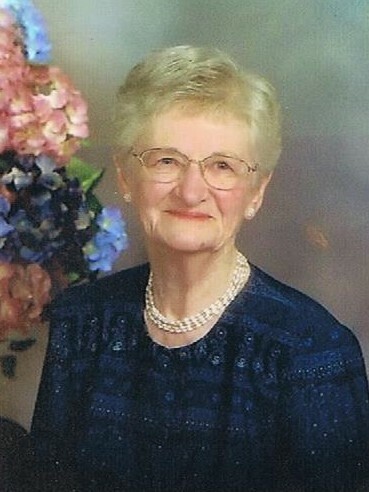 Starling graduated from Washington Local Schools in Byhalia in 1936 and then obtained a degree in Elementary education from Ohio Northern University in 1938. She taught in the Byhalia, Ridgeway and West Mansfield Schools and she also substituted for many years. She was a member of the Calvary Baptist Church in Bellefontaine. She enjoyed family get togethers, birthdays, Christmas with family and eating at McDonald's with her many friends. Starling enjoyed her flowers and always had red roses, flower gardens and house plants. She loved to read and having her children and grandchildren visit. Christmas morning at her house with all the family was a special time. She shared special times with nieces, Lisa Jo Lay and Ruth Ann Rudowski and special friends Connie Houchin, Barb Shumaker and Mildred Wilson. In lieu of flowers, memorials may be made to the Hardin Hills Activity Fund or a charity of your choice.